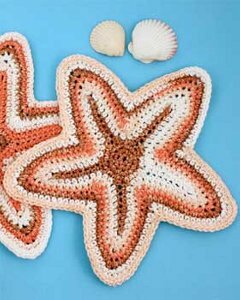 0This easy crochet pattern mimics the phenomenal color changes in our friend the starfish, so you can keep a momento of the beach without getting sand between your toes. Chain 2. 1st rnd: 5 sc in 2nd ch from hook. Join with sl st to fi rst sc. 2nd and 3rd rnds: Ch 1. 2 sc in each sc around. Join with sl st to fi rst sc. 20 sc at end of 3rd rnd. 4th rnd: Ch 1. 1 sc in each of next 2 sc. *Ch 9. Working in back loops only, 1 sc in 2nd ch from hook and each of the next 7 ch. Working in both loops, 1 sc in each of next 4 sc. Rep from * 4 times more; ending last rep with 1 sc in each of last 2 sc. Join with sl st to fi rst sc. 5th rnd: Ch 1. 1 sc in fi rst sc. *Miss next sc. Working in rem loops from previous rnd, 1 sc in each of next 7 sts. 3 sc in next st. Working in both loops, 2 sc in next sc. 1 sc in each of next 7 sc. Miss next sc. 1 sc in each of next 2 sc. Rep from * 4 times more, ending last rep with 1 sc in last sc. Join with sl st to fi rst sc. 6th rnd: Ch 2 (counts as hdc). *1 sc in each of next 8 sc. (1 sc. 1 hdc) in next sc. (1 hdc. 1 dc. 1 hdc) in next sc. (1 sc. 1 hdc) in next sc. 1 sc in each of next 8 sc. ** Draw up a loop in each of next 2 sts. Yoh and draw through all loops on hook - sc2tog made. Rep from * 3 times more, then from * to ** once. Miss last sc. Join with sl st to top of beg ch 2. 7th rnd: Sl st in each of next 2 sc. Ch 1. 1 sc in each of next 9 sts. 2 sc in next hdc. *(1 sc. 1 hdc. 1 sc) in next dc. 2 sc in next hdc. 1 sc in each of next 9 sts. (Yoh and draw up a loop in next st. Yoh and draw through 2 loops on hook) 3 times. Yoh and draw through all loops on hook – dc3tog made. Rep from * 4 times more. Join with sl st to fi rst sc. 8th rnd: Sl st in next sc. Ch 1. *1 sc in each of next 10 sc. 2 sc in next sc. *(1 sc. 1 hdc. 1 sc) in next hdc. 2 sc in next sc. 1 sc in each of next 10 sc. Draw up a loop in each of next 3 sts. Yoh and draw through all loops on hook – sc3tog made. Rep from * 4 times more. Join with sl st to fi rst sc. 9th rnd: Sl st in next sc. Ch 1. *1 sc in each of next 11 sc. 2 sc in each of next 3 sc. 1 sc in each of next 11 sc. Sc3tog. Rep from * 4 times more. Join with sl st to fi rst sc. 10th rnd: Sl st in next sc. Ch 1. *1 sc in each of next 12 sc. 2 sc in each of next 3 sc. 1 sc in each of next 12 sc. Sc2tog. Rep from * 4 times more. Join with sl st to fi rst sc. Fasten off .